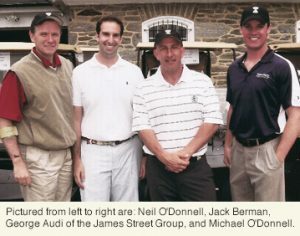 The O’Donnell Law Offices sponsored and participated in the 4th Annual Bill Haggerty Memorial Golf Tournament, a charitable golf event supporting the Duke University Tisch Tumor Center. The golf tournament was conducted on Monday, May 21, 2012 at the Manufacturers County Club in Fort Washington, Pennsylvania. Funds raised from the Bill Haggerty Memorial are donated to the Tisch Center. Attorney James C. Haggerty served as tournament host and marshal.